By coincidence there has been three separate comparisons recently published of where the cheapest cinema tickets are to be found in France, Germany and the UK, with telling differences between both regions and countries. Screen Daily first up asks “Are UK cinema ticket prices sustainable?” The article draws on research by Voucherbox.co.uk at the differences in cinema ticket price across the country, which finds a wide discrepancy in prices between cities like London and Cardiff. The former can cost you as much as £15.99 (€17.76) at a Vue cinema, whole in the latter Vue charges on average £4.00 (€4.40). “While some variation in costs across the UK is to be expected, consumers don’t expect a 300% increase. This is just not comparative to the cost of living,” Shane Forster, UK country manager of Voucherbox is quoted as saying. UKCA’s Phil Clapp notes that cost of rent and living wage pushes up the price in places like London or Edinburgh. Yet a 300% differential still seems steep, particularly when we net look at France and Germany. It is worth remembering, however, that the ‘Unlimited’ cards offered by Cinemworld and Odeon tend to even out prices, with only a couple of pounds more typically for London cinemas. Meanwhile across the Channel the cheapest cinema tickets are to be found in Bretagne (€6.07), which also has the highest concentration of arthouse cinemas (75.6%). Provence-Aloes-Côte d’Azur (€6.87) is the most expensive region, even more so than Paris’ Ile-de-France (€6.71). 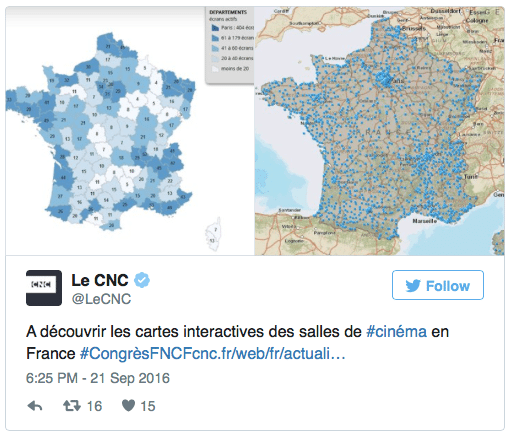 These are some of the findings by the CNC study on cinema statistics geography – telling that this work is done by an online discount company in the UK and the national cinema body in France. Also interesting that the spread is less than a euro. Finally in Germany Dortmund is revealed as the city with the cheapest cinema tickets at just €7.65 (or €5.50 on a discount day). This compares to €10.30 in Duisburg, which tops the list for expensive cinema cities, still as high as €8.20 on discount days. Interestingly the two cities are only 50km apart. 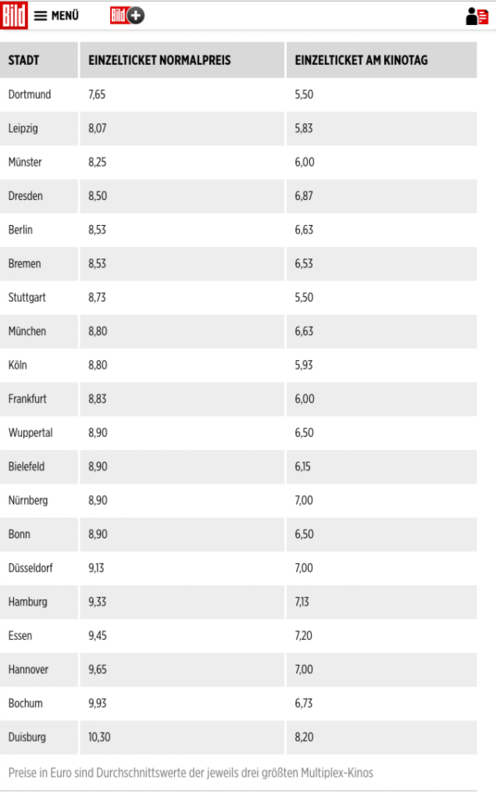 Here too tabloid Bild is publishing data from online discount portal Gutscheinsammler.de that averaged the price of three multiplexes in each city. Overall it thus seems that Europe’s biggest cinema market (France) is also the best for price, while the UK stands out both for big differences in price across the regions that are both more expansiv and cheaper than anything in either France or Germany. UPDATE: We have received good feedback on this article and thought that it would be good to delve deeper into some issues raised by this comparison. The first observation is that while UK cinema ticket prices are both more and less expensive (depending on which city you chose) than those in France and Germany, there are plenty of countries where it is more expensive to go to the cinema – Austria, Norway, Denmark and Sweden to name just four. And even these pale in comparison with Japan, which has the world’s most expensive cinema tickets (again driven by real-estate costs). Furthermore, France benefits from having reduced levels of VAT (sales tax) on cinema tickets at just 5.5% compared to the standard rate of 20%. The issue of Vat is a big one for the cinema industry in Europe, with Spanish exhibitors labouring under 20% and Swedish ones threatened with hikes to a similar levels. We mentioned ‘Unlimited’ schemes, which exist with operators such as UGC, Cineworld and even art-house operators like the Yorck Group. Not taking these into accounts does not present a full picture of the price differentials. But the deep discounting for children in France (particularly the ‘€4 under 14’) also has an impact on the average price. This scheme, which was a deal between the French exhibitors’ association and the French government some years back was struck to keep that lower level of VAT in return for persuading more children to go to the cinema.